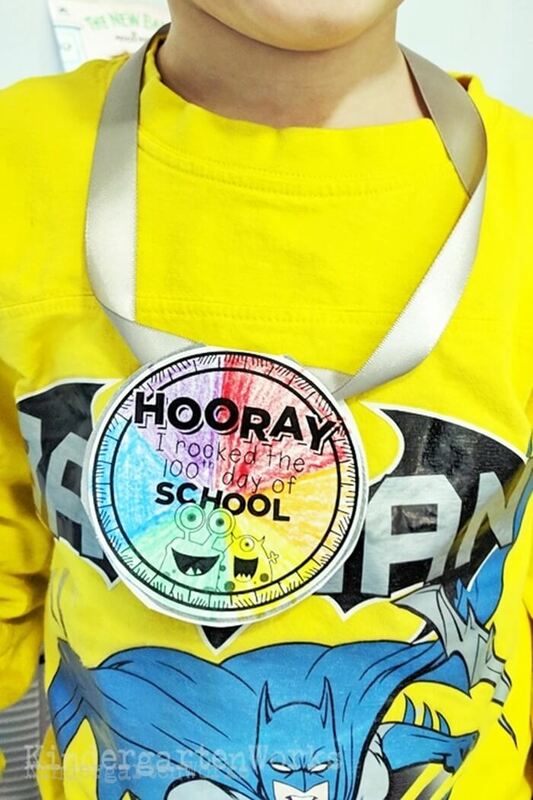 Are you gearing up for the 100th day of school in kindergarten? 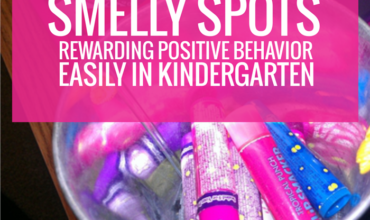 I am working here behind the scenes to help you pull off a fun and learning-filled day. I’ve got some freebies to share as a result. 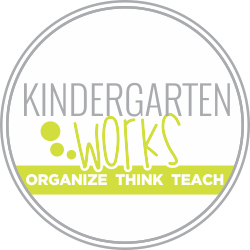 It’s my goal on KindergartenWorks to have your back – by helping you keep the beauty in kindergarten with age-appropriate things that make learning fun and the cool thing to do. Let me share how to create a fun filled learning day that doesn’t require a ridiculous amount of prep work or require you to throw the entire routine you’ve worked to establish out the window. So, let’s jump in. I’ll use the 100th day of school as my example here – but really, we could apply this to any minor or school-only holiday. What if instead of making the whole 100th day just about the number 100 (and counting to 100… and counting 100 things… and stamping 100 things… and building with 100 things) we made the day “themed” and pulled in the number 100 in age-appropriate ways throughout the normal classroom day? 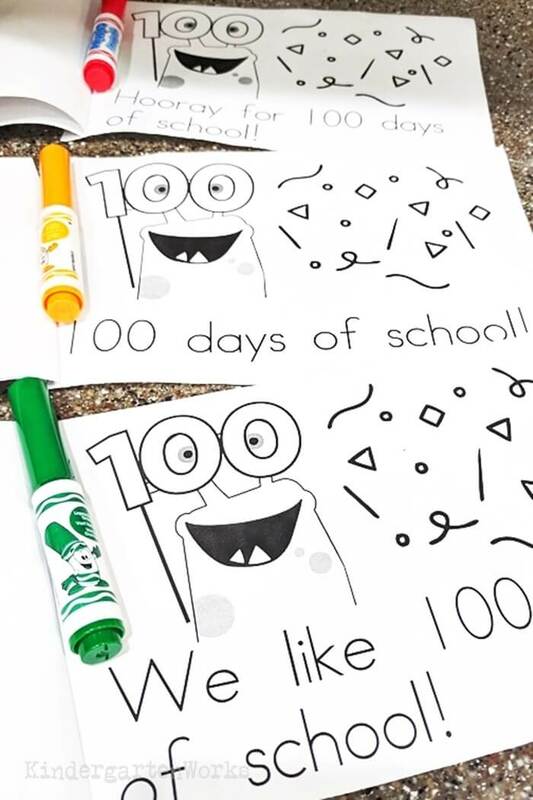 While there’s nothing wrong with doing any or all of those listed things on the 100th day of school – it’s just that it can get old really quick and take a lot of prep work. Here’s my overall thinking when it comes to planning a special school day: Keep what you absolutely love about the 100th day of school and give yourself permission to ditch the rest. Elaborate, amazing, intricate ideas found on Pinterest? Love ’em – but I’ll pass. Remind yourself: what’s your goal? When I planned for special school days, like the 100th day of school, I honestly tried to keep as much of the same routine for the day as possible. Building the anticipation to 1 or 2 “different” things in the day was just right and is age-appropriate for kindergarten. After deciding what non-negotiables are in your normal routine – plan the leftover chunks of time accordingly. These are great time slots to add your “just fun stuff” like – making a Froot Loop necklace of 100 pieces or adding in an extra read aloud. See if/where you could easily tweak the plans you already have. This way the day feels cohesive. That’s really how to use your routine to your advantage. You pull off a fun, themed day with learning at the forefront. Let me share what that’d look like for me! Here’s how I’d plan a 100th day for kindergarten. I would keep my calendar binder time. We’d probably keep it pretty normal except I might add in a counting video to 100 to celebrate and get the wiggles out. I’d keep my guided reading time. I’d use kinder-friendly emergent readers that tie into my theme (if possible). Literacy centers in our classroom stay the same all year so that’s an easy pass for me. 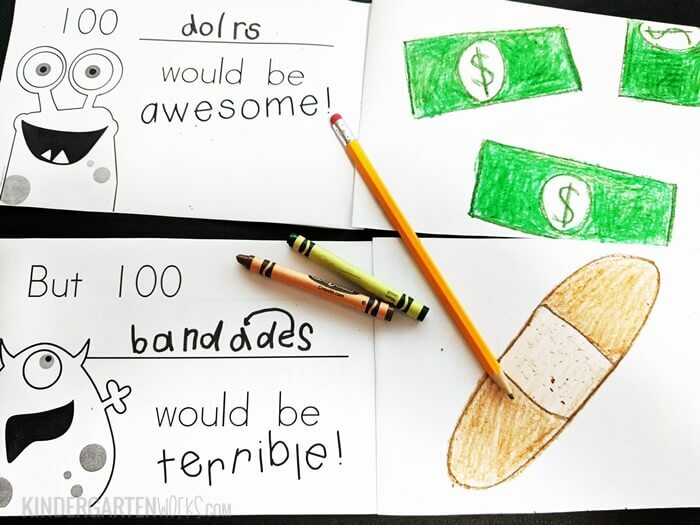 You could easily use these free 100th day themed emergent readers I created for you. There are 3 different levels so hopefully your whole class would be covered. See, I’ve got your back. I would keep my guided math time. 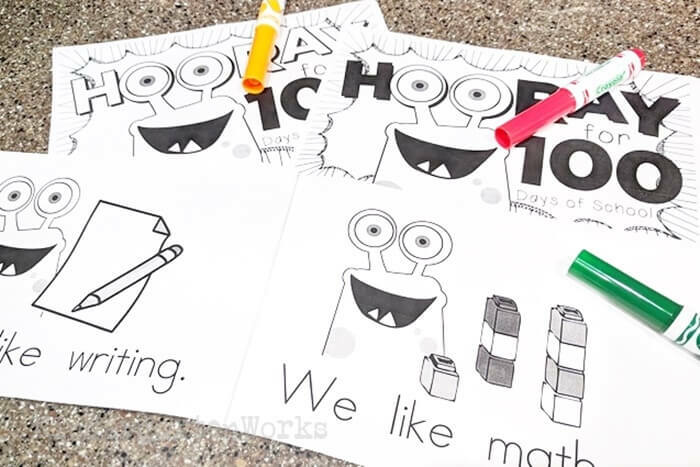 That means the math zones don’t really change much – but I could tweak an activity or two in the teacher zone (where I meet with small groups) to work on numbers to 100 in a fun way (based on what my groups need). I’d keep my writing time. 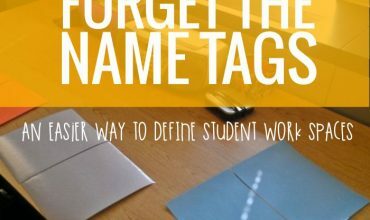 I’d use a kinder-friendly prompt that relates to the theme. In this case – we’d start a writing project and make a mini-book about batches of 100 things. You could use this free, cute book too with your students and they could write about the number 100 in creative ways. I would keep my read aloud… and probably add in at least an extra one for the day. Inserting an activity listed above would take longer than a mini-lesson normally would… so I’d change the length of our centers or other scheduled items to accommodate the time needed. I’d keep my anchor parts of the day, pull the theme into those anchor parts where it made sense and insert a few purely fun 100th day themed things. The day is more manageable and easy to plan that way. 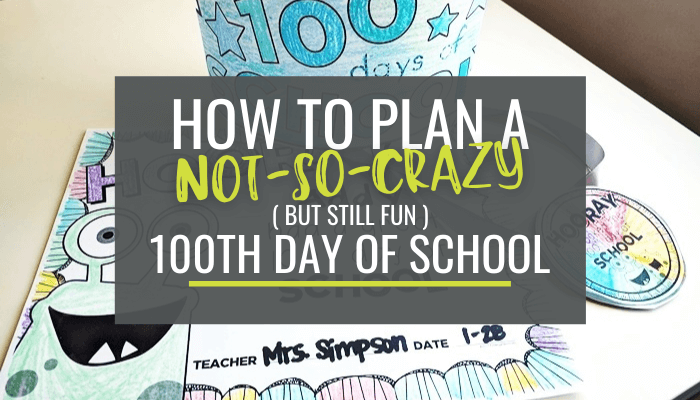 If you’re looking to simplify your 100th day of school or researching how to plan a special school day that isn’t over the top – I hope this can help. This is my same planning recipe for Valentine’s day, St. Patrick’s day, Halloween and Thanksgiving. Cute Writing Activity Mini-Book – Hooray for 100!